Correct, your confusing a base speaker and a sub speaker. Subs are designed with their own powered amps 5-80, I like mine at 30. so it only gives you the chest punches tones. next comes your base speaker, middle, then tweeter. Mr. Shikhir is absolutely right, bass range is upto 200 Hz. So is there any possible modification in the circuit?? Actually i am stand in kendirya Vidayalay INA colony school. i am very interest to make theis type things thay way i need ur help. 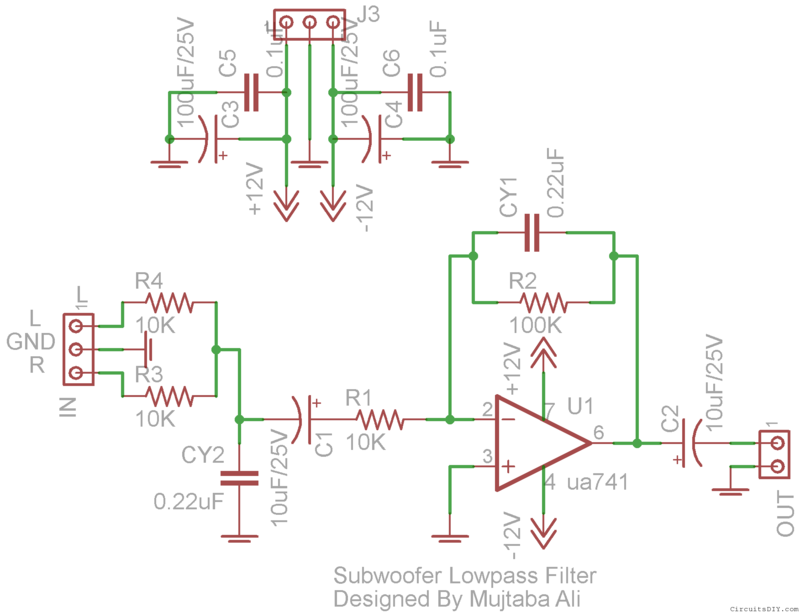 please can you give single supply lowpass filter circuit. Thank you. i want a help that how to connect this ckt to audio amplifier ckt, becoz i have an audio amp of double ICs of TDA2005.how much range(max. & min.) of voltage can i give it. where it will connect before amp or after amp. Assemble this circuit on Breadboard or VeroBoard (as you required), Feed the power from Dual Power supply. Connect the input wire of this circuit (L GND R) to your source of sound equipment like PC, Laptop, Mobile, iPod, Television etc. Connect the audio input of your TDA2005 (as mentioned) amplifier to the output of this circuit. what the lick between the two circuits? for what purpose there is a circuit at the top ? what about the small circuit in the top of the diagram ? where i want to connect it.? What about the small circuit on the top of the diagram. where i want to connect it ? How much is the gain of this preamp?I build this and its works but seems the volume is low.How can i increase the volume of my subwoofer?